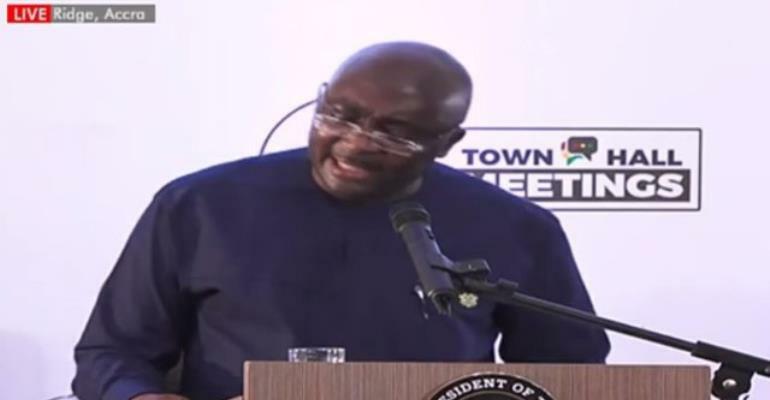 It was a comment that was rescued from the archives for another round of viral sharing as the cedi suffered another hurtful depreciation in 2019 under the watch of the Vice-President, who is head of the government’s economic management team. The calls for the Vice-President to deliver his signature economic lectures while in opposition, have been growing. But coming with a caveat, he explained, there are other possible factors that can affect the exchange rate. “Even with strong economic fundamentals, speculations, expectations and investor sentiments can exert pressure on the exchange rate,” he said. Dabbling in logic, the Vice-President explained that to insist that a depreciation in the currency means the fundamentals are weak is “warped logic”. Perhaps finding the explanation too intellectual, the Vice-President praised for his penchant for simplification, used the analogy of a broken leg. “If I come to you and say if your leg is broken, you are going to be unable to walk” and i f it is heard that someone is unable to walk, “can I just conclude that your leg must be broken,” he said before the rapture of applause drowned his signature derisive laughter. He showed figures of the country’s economic fundamentals as supervised by the NDC government under John Mahama. Dr. Bawumia pointed out the fiscal deficit was 10.1% of GDP, public debt was 70.2% of GDP, inflation was 17% while GDP growth slumped from 7.3% to 4%. 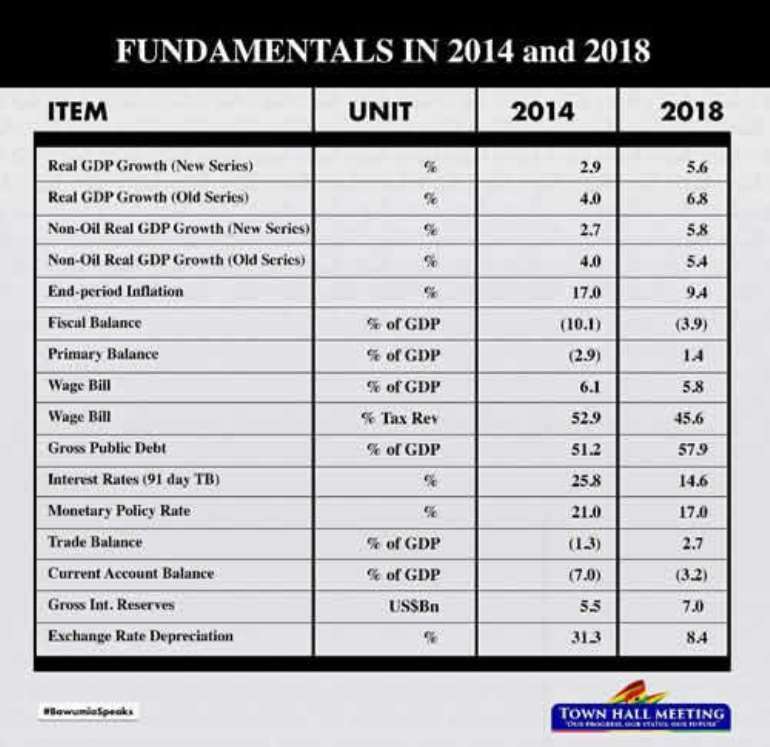 These “significantly weak” fundamentals were behind the cedi losing 31.3% of its value in 2014. But a look at the economic fundamentals under the New Patriotic Party (NPP) he said, showed stronger stability with inflation hovering at 9.4%, interest rate dropping. He concluded that with these figures, an investigation of a 5.9% depreciation of the cedi as experienced in 2019 must look into other factors ruling out the fundamentals as the cause. “Let me tell you what happened,” he began telling a story of how the cedi depreciated because the IMF had set a condition to the Bank of Ghana to increase its net international reserves – that reserve denominated in dollars meant the central bank needed to add $800m to its vault. It meant that the BoG could not release dollars into the economy at a time when demand was high, he explained. Vice-President Dr. Bawumia said when the economic fundamentals were weak in 2014, it compelled the Mahama government to go for an IMF bail-out. If Ghana is existing the IMF Extended Credit Facility in April 2019 after three years, it could only be that the fundamentals are strong, he said. Dr. Bawumia who has shown no sign of losing interest in jabbing former President John Mahama, picked up on his comment that the NDC was ready to match the NPP government “boot-for-boot”. That comment was made in a purely political contest. But Bawumia picked it up for an economic reply. “Then you say ‘boot-for-boot, this one is more like ‘boot for Chalewote’,” suggesting that on matters of the economy there is a no contest between the NPP and NDC. His analogy once again provoking laughter in an auditorium dominated by NPP government functionaries and supporters. Analysts have said Ghana’s constant need for dollars in order to bolster the cedi shows deeper structural problems not only in Ghana but in Africa.